We have been speaking up for children’s right to an education by taking part in the Send My Friend To School Campaign. 37 million children around the world are not able to go school because of conflict, disasters or other emergencies. We decided to make rucksacks with messages inside saying what we would miss if we were unable to go to school and urging world leaders to help. 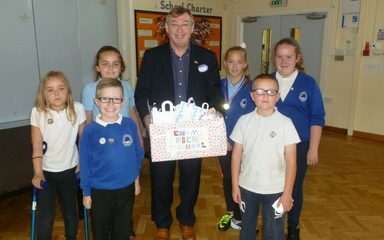 Our local MP Ian Mearns came into assembly on Friday 8th July and promised that he would take our rucksacks on a journey to London and hand them over to our Prime Minister, Theresa May. We are so very lucky that we can all come to a safe and inviting school everyday and be part of exciting learning. It’s unbelievable that millions of children are not able to go to school. What would you miss if you couldn’t come to school? I would miss all of your smiling faces! We don’t realise how lucky we are! I would miss all the fantastic learning opportunities, I learn still learn something new everyday.